Today, Catalan President made a decision that could change the face of global business forever. Though he stopped short of the full declaration of independence that was approved by the region’s voters on October 1 in a disputed process that was quickly followed by violent strikes and protests, what remains in the uncertainty in a potential settlement with Spain or future declaration of independence are economic consequences that could be disastrous at worst and disruptive at best. It is estimated that secession would cost Spain almost 20 per cent of its economic output, and trigger a row about how Catalonia would return 52.5 billion euros of debt it owes to the country’s central administration. Catalonia is the principal Spanish industrial area, with automotive engineering, electronics, chemistry, and textiles as its primary growth industries. Services represent 60 percent of economic activity, industry 36 percent, and agriculture less than 4 percent. 1 out of every 4 vehicles manufactured in Spain is produced in Catalonia, making it Spain’s most significant automotive manufacturing center, with Nissan and Volkswagen having significant footprints in the region. An independent Catalonia would have a GDP of $314 billion (£195bn), according to calculations by the OECD, which would make it the 34th largest economy in the world, bigger than Portugal or Hong Kong. Its GDP per capita would be $35,000, which would make it wealthier than South Korea, Israel or Italy. In 2015, when the separatists won election, 683 companies left Catalonia, fearing political and legal instability, including the Derby Hotels chain, multinational Suez and agri-food giant Valls Companys. Together the firms represent combined sales of over €1.5 billion. According to ratings agency Axesor, 3,286 businesses have left Catalonia since 2012, when the separatists began gaining traction. Of all the businesses to leave Catalonia, 306 have moved to Madrid, including the holding company Inaves – an umbrella group for several agri-food firms such as Valls Companys, which employs nearly 2,000 people. At the same time, multinationals such as US-based food conglomerate Mondelez have decided to concentrate operations in the Spanish capital. But figures handled by Axesor show that the number of new firms in Catalonia is not compensating for the departures: this year, 683 businesses worth a joint €1.5 billion have left, while 133 worth €615 million have arrived. More recently, banks, energy, textile and biotech firms have also announced their intention to move their headquarters elsewhere. The shifts in confidence are due to uncertainty around EU membership (all member states, including Spain, would have to agree to admit an independent Catalonia to the bloc) and World Trade Organization status, the lack of either of which could lead to stiff trade barriers for the new state. It is unlikely that Catalonia will be able to turn against the will of its people, who, with their own language and cultural identity, have never considered themselves “Spanish”. However, reconciliation and negotiation with Madrid is still possible and is the best-case scenario. A successful settlement would still likely include a provision for a “legal” referendum on independence, but would also include additional provisions to provide the region with a better tax deal and greater fiscal autonomy. If negotiations stall to a point where the declaration of unilateral independence is announced as was expected today. It may prompt Madrid to trigger Article 155 of the Spanish Constitution, stripping the region of its current autonomous status and putting it under direct rule of the central government. This could lead to snap elections in both Catalonia and potentially Madrid, creating massive turmoil and uncertainty across Spain. The first step is to understand your company’s exposure to the region at a part and product level by mapping your supply chain. Resilinc has mapped over 400 manufacturing sites across the high tech, automotive and life sciences industries, with the bulk of those suppliers in and around Barcelona, at the center of the strife. Trade barriers: Knowing which products are sourced from the area will assist companies in monitoring potential trade barriers or impacts as they arise, if independence takes effect as EU and WTO issues are sorted out. Supplier flight from region: Knowing which suppliers have exposure to the region will allow companies to influence the locations where production is shifted, proactively assess the resulting risk (e.g. prevent consolidation of alternate sites or create geographic clustering both of which can create unacceptable concentrations of risk), and mitigate issues as needed. Labor shortages: The crisis has been characterized by massive strikes and protests numbering in the hundreds of thousands of people. As the situation evolves, large gatherings are expected to continue, with workers pulled away from their jobs (often with employer permission) to participate in the process. As their labor demonstrates in the streets, factory underutilization, delayed shipments and capacity constraints is expected to occur. 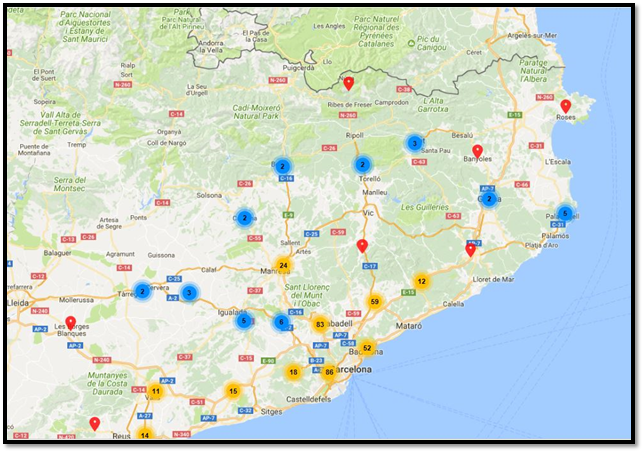 Logistics delays: Companies should monitor the locations of the protests and gatherings as related to their mapped supplier sites to understand potential logistics chokepoints and proactively work with their suppliers (especially in the Barcelona area) to assure that they have alternate transportation routes and modes identified as a part of their business continuity planning process. As always, Resilinc customers should monitor EventWatch for developments on the situation as it evolves.